The Simplee Cleen Ultra MicroFiber BLUE Drying Towel is a generous 25 x 36 inches and is woven with an 80/20 blend of polyester and polamide microfibers with a tuffted, high pile loop. The tuffed waffle pattern makes this towel 100% scratch-free on even the most delicate car or fragile surfaces. The Ultra MicroFiber Drying Towel is easy to wring out and continues to work absolutely streak-free, even when damp. Designed specifically for use on delicate surfaces such as pet drying, people hair drying, baby bathing, stainless steel, metal, fiberglass, tile, granites and much much more!! Amazing for pet and people hair. Our office personnel use these towels for their pets and for themselves and family members. We have found that this towel reduces tangles, hair lose and frizz. We absolutely love this towel for our hair and our pets hair. 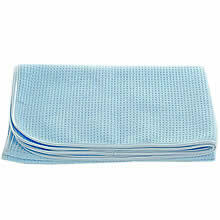 When you wash the towel, it keeps it's shape, softness and beautiful light blue color. Most of us has had this towel for over 4 years now. The towels still look brand new and will always use this towel as long as they are available which we hope is forever. MsKitti uses hers for her hair. She pats her long hair for 1 to 2 minutes and her hair is drip dry. No rubbing which causes tangles and hair to fall out. Unbelievable that her hair is already drip dry in such a short time and uses a comb afterwords. Whoa!! She said the towel absorbs so much water from her hair that its almost dry after the 1 to 2 minutes of patting. Treva uses her towels for her dogs. She said nothing absorbs the water from her dogs coats like this towels in such a short period of time. She has one long hair dog that she pats with the towel and her results are a easy comb out. We discontinued selling quite a few other towels because they don't even compare to this towel. • Size: 25" x 36"
• Material: 80/20 blend of polyester and polamide microfibers with a tuffted waffle pattern, high pile loop.